At Brickell City Centre – the $1.05 billion, mixed-use complex that broke ground in downtown Miami in February 2012 — Whitman Family Development, LLC, is partnering with Hong Kong-based Swire Properties, Inc., to develop, lease, manage and market more than one-half-million square feet planned for retail, dining and entertainment at the new development, located in one of Miami’s fastest growing residential areas and one of the most important international financial districts in the United States. “With its immediate proximity to a thriving and affluent residential neighborhood, as well as its enviable access to the flourishing Brickell-area tourism and hospitality markets, this is a truly inimitable retail location,” said Matthew Whitman Lazenby, President and Chief Executive Officer of Whitman Family Development, LLC. In a January 31, 2013 statement announcing this first-time partnership with the Miami Beach- based company best known for its luxury retail destination, Bal Harbour Shops, Swire Properties said Whitman Family Development will “contribute both meaningful equity and its brand recognition and luxury retail expertise as co-developer of the retail component. . . .
“The venture bolsters the vision that Swire Properties has for Brickell City Centre becoming the leading destination in the heart of Miami for exclusive shopping and dining,” the Swire Properties statement read. The upscale retail areas planned for Brickell City Centre will be the first of their kind in the Brickell Neighborhood — and represent Swire Properties’ first venture into retail in Miami. “It’s very hard for us to make any claims we know the local market in terms of retail,” Swire Properties Chief Executive Martin Cubbon told the Miami Herald. Lazenby — the fourth generation in a family whose history includes many notable commercial real estate developments in the Miami area over close to 100 years — said the strategy his family has pursued at Bal Harbour Shops, the internationally recognized shopping center on Miami Beach, will also guide retail development at Brickell City Centre. “No single element is more important to the long-term viability of a successful retail project than its merchandising mix,” Lazenby said. “Ultimately, we aim to achieve the right mix of different uses, so as to create an enduring – and ideally somewhat unpredictable place in terms of its tenancies,” he said. In 2012, the International Council of Shopping Centers named Bal Harbour Shops — founded in 1965 by Lazenby’s grandfather Stanley Whitman — the world’s most productive shopping center, based on annual sales per square foot. In 2013, the celebrated, open-air shopping center broke its own outstanding record for retail sales. “Built over generations, the credibility of Bal Harbour Shops with the luxury retail market, evidenced by the extraordinary sales performance of its centre in Miami, will be of tremendous value to the market positioning of Brickell City Centre as a destination shopping experience for residents and visitors alike,” said Swire Properties President Stephen Owens. 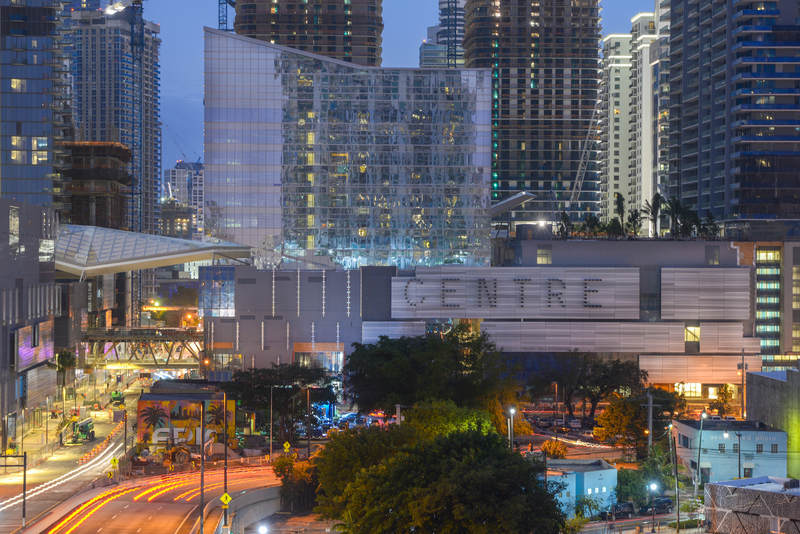 The mix of predominately luxury retailers with upscale to upper-moderate retailers, a major store, restaurants and entertainment is planned for the lower four levels of Brickell City Centre. Designed by the Miami-based architectural firm Arquitectonica, the development includes a gross floor area in excess of 5.4 million square feet — including office, residential, hotel, retail and entertainment space, as well as underground parking. The hotel, offices, condominiums, and retail areas will be connected at street level by covered pathways and connected by bridges overhead. Sometimes described as a “city within a city,” Brickell City Centre will encompass more than four blocks in the area south of the Miami River and west of Brickell Avenue. The first phase — including most of the retail component — is already under construction and scheduled for completion in 2015. “Our goal is to develop a structure that will be artful in its mix of uses and will advance Brickell Avenue’s stature as Miami’s premier destination,’’ Owens said in a statement. “The plan envisions grand plazas and retail shops connected to Brickell City Centre’s phase one, now under construction,” the statement read. Encompassing more than 10 acres, Brickell City Center is designated by the City of Miami as a “Special Area Plan,” ensuring, in part, “greater integration of public and private improvements and infrastructure; to enable thoroughfare connectivity.” As a result, Brickell City Centre will include Miami’s Eighth Street Metromover Station. The elevated Metromover train circulates through Miami’s downtown at no cost to passengers and connects to Metrorail, the train that connects the city to its suburbs to the north and south. “With our newest projects already under construction in Miami’s dynamic Brickell Neighborhood, Whitman Family Development is poised to enter our second century in Miam-Dade County at the forefront of innovative urban development, with our latest upscale retail destination — Brickell City Centre,” said Lazenby.